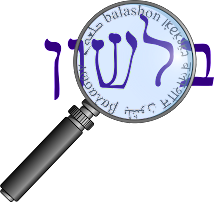 I'm going to start a new feature on Balashon - an occasional (approximately weekly, but don't hold me to it) post about a letter of the Hebrew alphabet. Naturally, we'll start with alef (or aleph). Alef is the first letter in the Hebrew alphabet, and is the predecessor of the Greek alpha and the English letter "A". The Hebrew word elef אלף means ox, and the original shape of the letter resembles the head of an ox. See this site for a wonderful graphic demonstration of the development of the shape of the letter from the "ox head" to the letters used in Hebrew, Arabic, Greek and Latin. Klein writes that elef originally meant tamed animals, and the verb אלף meant "to train, to teach". From this meaning we get the word ulpan אולפן - which originally meant teaching, and now often refers to a school for the intensive learning of Hebrew. Ulpan can also mean studio - as in a room where radio and television shows are produced. Klein does not mention that definition, but perhaps it is related to the original meaning of the word "studio" - "a room for study". Going back even further, we find that Klein says that that אלף meaning "teaching" derives from a "base probably meaning originally 'to be linked together, be connected' [cp. Akkadian ulapu (=band), elippu (=ship), whence arose the meanings 'to join, to be familiar with'." From this early meaning we get the word elef אלף - thousand, which Klein claims originally denoted "group, crowd". Another related meaning of elef is "part of a tribe" which originally referred to "part of a tribe consisting of a thousand people". The head of the tribe was known as an aluf אלוף - and from this we get the modern Hebrew words for "general (in the army)" and champion. Alef is a guttural letter and therefore occasionally switches with other guttural letters - heh (אמון המון), ayin (מתאב מתעב) as well as yod (דואג דויג).